Based on Games Workshop's long-running, dice-throwing board game, and set in the Warhammer Universe, Blood Bowl is a fantasy football game, loosely based on American Football. 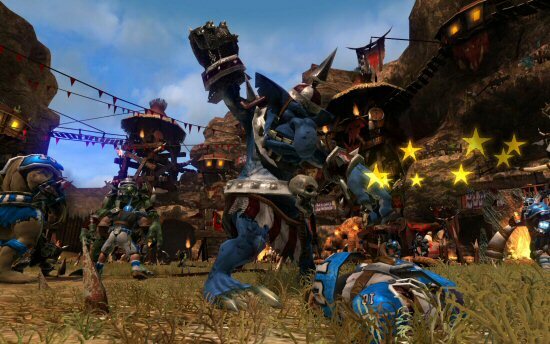 With eight races to choose from, including Orcs, Trolls, Lizardmen and Goblins, each team has its own strengths and weaknesses and rules are thrown out of the window as you use special abilities to maim, stamp on your opponents, or do anything it takes to score a touchdown. Career mode sets you up with a small pot of cash and you earn more by winning which allows you to hire members and build your fantasy team, bribe referees, or even buy potions that aid you in the matches. You can also dish out training prior to matches to help improve player’s performance. Finally, a multiplayer mode allows you to set up private and public matches as well as competitions.